The compact Weslo Pursuit CT 1.5 upright exercise bike can be found for less than $150 which makes it sound like a bargain, but you won’t think it such a good deal when it stops working after a few workouts. The Weslo Pursuit CT 1.5 upright bike has an LCD display on the console which tracks your speed, time, distance, calories burned and pulse. On the 2 workout apps, the bike automatically adjusts the resistance for increased intensity. The Target Pacer feature is an indicator light that flashes when it’s time to pedal harder or softer to stay in your goal zone. The console is battery operated. UPDATE: The Pursuit CT 1.5 has been discontinued. If you're interested in buying a Weslo exercise bike check out the selection of popular models on sale at Amazon. The Weslo Pursuit CT 1.5 upright exercise bike offers eight different levels of magnetic resistance which can be adjusted at the turn of the tension knob. There are a lot of cheap parts used in the making of this bike – which is why the warranty is only for 90 days – so don’t expect it to last long. And here is a warning: although the brochure states it has a 250-lb maximum user weight capacity, this 66-lb frame will wobble under most adults. Reviews by users have complained about the overall cheapness and lack of quality in the bike, especially noting the uncomfortable seat and the thumb heart rate sensor being wildly inaccurate. Assembly is easy enough, and the price is low, but if you plan on starting an exercise program to lose weight, you’ll be disappointed if you choose this bike. The Weslo Pursuit CT 1.5 upright exercise bike is an ICON Fitness product that sells for around $139 to $159. It gets mixed reviews, even though it is about as unreliable as you would expect a cheap bike to be. 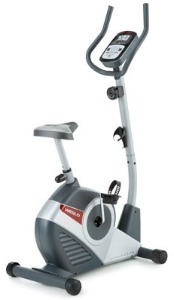 If you can go a little higher in price, you would be better off with a Schwinn A10 or a Stamina Upright Bike at $175 rather than any of the Weslo models. You’ll find those brands put out decent products that get surprisingly good reviews for what is still a budget bike.